To collect information of heavenly bodies like star, sun, planets etc the scientist have made various kind of researches; to search earth like as well as new planets nearby our solar system they are using Hubble Telescope and also using different techniques like using rays, radiation etc they are doing study on different heavenly bodies. 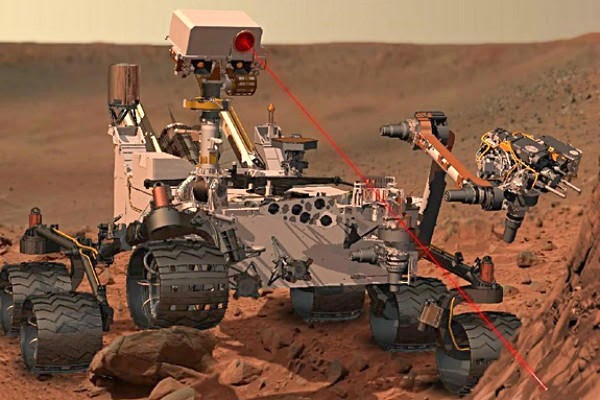 Similarly they have developed a robot called curiosity mars rover to study different features of Mars planet, search water existence, life existence etc. The curiosity mars rover robot is a car robotic which is a size of car exploring the Gale Crater on the Mars planet as the Mars Science Laboratory Mission of NASA. This robot was launched to Mars planet on November 26, 2011 from the Cape Canaveral which successfully landed on Aeolis Palus in Gale Crater on August 6, 2012 on the Mars Planet. The Bradbury Landing site was less than 2.4 kilometer (1.5 mile) from the center of rover’s touchdown target after a 563,000,000 kilometer (350,000,000 mile) journey. The main objective of curiosity mars rover was investigating the climate and geology of Martian as well as the environment conditions inside Gale Crater for microbial life together with the role of water and planetary habitability studies in preparation for the future human exploration. According to the design of Curiosity it will serve as the basis for a planned Mars 2020 rover mission. The two year mission of Curiosity was extended indefinitely in 2012 December. Due to the solar conjunction of Earth and Mars around 25 days the Curiosity went into an autonomous operation in May 2013. At this time period the robot continued to monitor the atmospheric & radiation data but didn’t move on the surface of Martian.